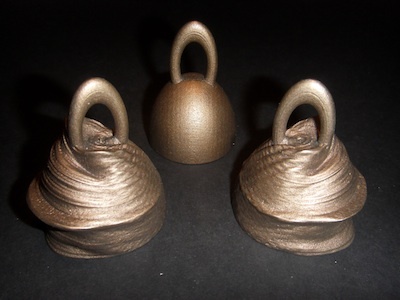 These Bells are Physical Sonifications of the Head Related Transfer Functions (HRTF) measured from a Kemar Dummy Head. They were made in response to György Wersényi’s sonification challenge for the ICAD 2011 Conference in Budapest. The HRTF dataset is a spatial array of spectral filters measured from the left and right ears of a dummy head. The construction of the bells is described in this paper presented at the ICAD 2011 conference in Budapest. The Left and Right Bells sound different from each other, and from the base Control Bell. Spectrograms of the Left and Right Bells show the superposition of doubled harmonics that is easily heard. The immediate audible difference between these two large complex datasets that is not readily observed in the visual form suggests that the Bell could characterize a HRTF dataset in a way that could be useful for classification and recognition of HRTF datasets. The HRTF Bells are currently being shown in the Creative Practice exhibition curated by Diane Firth at the Belconnen Arts Centre in Canberra from 22 July – 7 August 2011.